Poor Jens is broke, and he hasn’t found a job yet. So he is living with Grandma (Oma) for the rest of the summer. 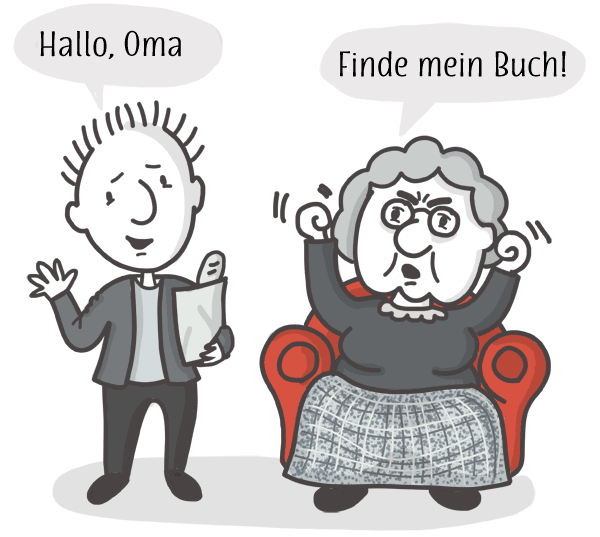 The problem is that sometimes Oma is very cranky, but Jens must remain polite at all times. Remember how you learned that German has a formal and informal way of speaking? The same is true for commands. If Jens wants to ask for something, he must do it politely, even when Oma is in one of her commanding moods. And Oma doesn’t usually say anything polite to Jens. She certainly doesn’t use the polite form for commands. In German, you can make a polite request or command by placing the full verb at the beginning of the sentence, followed by the polite form of “you” (Sie). If you want to politely ask someone not to do something, add the word nicht. When you are giving commands to friends or younger relatives, you would use informal commands. In order to make informal commands and requests, you have to remember the structure of German verbs. In the last lesson, Jens taught you that every German verb is made up of a stem plus an ending (either –n or –en). Informal commands are made using just the verb stem. So far so good, right? But as always, there are some exceptions. And here's another fun exception! Here are some verbs where the “e” in the stem changes to an “i” for the command. Guten Morgen! Wachen Sie bitte auf! Good morning! Wake up please! Bitte, kaufen Sie das nicht.